One way to extend the use and value of your house is to take full-advantage of and improve your outdoor living space with landscaping. Contemporary houses make rooms look larger by visually extending the room into the back yard, lawn or garden. The "tricks" can be as simple as adding glass walls, using the same wall material inside and outside and continuing the wall on the terrace or using the same ceiling material inside and out to extend a patio or terrace. 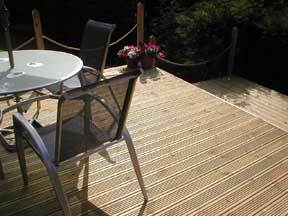 Dine under the stars on your patio, fire up the barbecue for weekend cook outs and escape the rat race. In the planning stages consider installing electric outlets for lighting, audio, barbecue accessories, etc. Incorporate your outdoor living room with the rest of the landscape by including pots, baskets and tubs of flowers and vines. If your outdoor patio area has a large bare wall soften the look with pots of plants or potted palms. 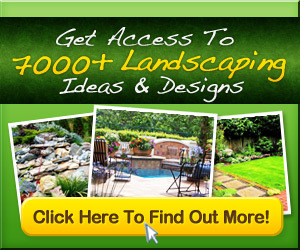 Create visual interest by building flower beds around trees, steps or walls. When an outdoor living space has been designed to be more accessible – it gets used twice as much. Convert a window in a living room to a French door. This makes it much more natural and inviting to step right out to enjoy the outdoors. Use flagstone and create a path leading out to the other parts of the yard. This leads people out and also invites people in. A hard flooring is of top importance, brick, crushed rock, wood block, cement, tile or flagstone make it easier to move furniture around and eliminates the concern of tramped-on turf. A sheltered area away from street noise, traffic, neighbors and wind also contributes to making your outdoor patio area more successful, also. The key to expanding any outdoor living area starts with planning and your lifestyle. Small group dinners, outdoor barbecues or a quiet secluded place to get away all play an important part in the design, décor, functionality and success of your outdoor living room.